I don’t know about the rest of you, but I am getting older. As I reflect back over the years, I think of how we used to do things before the easy availability of power tools. When I was a child skill saws and power drills were not common. I watch a carpenter today and I see nail guns, skill saws, electric screw guns and drills. The same thing applies to gardening and farms. Do I want to go back to doing things the old way, no. When it’s time to plant a garden, I love my rototiller. But what happens when the power fails and someday it will. Young people today have no concept of what it was like. I have been asking a lot of them question about simple things like yard tools and they look at you like you are talking a foreign language. I am only in my late 60s and I have seen tremendous changes. 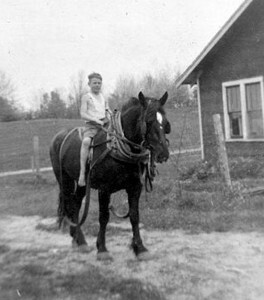 My father who is still alive was raised on a remote farm in Northern Michigan. Talking to him about his youth and how they did things is amazing. I have learned a lot from him. I strongly suggest that you take the time to look around your neighborhood and find someone who went thought the great depression and spend time with them. They have a lot of knowledge to share. Take advantage of the living history while it is still available. • Here is a list of ideas to talk about. • How did you preserve your food? Especially good if they lived on a farm. • Did you butcher your own meat and how did you preserve it? • How did you plant your gardens without power equipment? • What tools did you use? • If they didn’t have electricity. How did you light and heat your home? • What hand tools were the most important? • Get a list of tools they used. • If it is a woman, ask about recipes and cooking tips. If you get some good ideas don’t forget to share them with the rest of us. I am always open to guest posts. This entry was posted in food storage, gardening, recipes, Uncategorized and tagged gardening, Howard, living history, preserving food. Bookmark the permalink.